Dr. Lin is the Director of Clinical Genomics at the Genetics Branch of the National Institute of Health/National Cancer Institute (NIH/NCI). Prior to this, he led the computational analysis of the first ever exome sequencing studies for any human disease at Johns Hopkins and was a research instructor at Washington University in St. Louis. He has numerous publications in Science, Nature, Cell, Nature Genetics, and Nature Biotechnology, and has been featured in Forbes, Bloomberg, Wall Street Journal, Washington Post, BBC, TIME, and the Huffington Post. 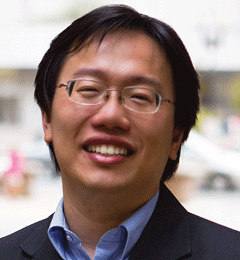 C. Jimmy Lin, MD, PhD, MHS, is a 2012 TED Fellow and Founder & President of Rare Genomics Institute, the world’s first platform to enable any community to leverage cutting- edge biotechnology to advance understanding of any rare disease. Partnering with top medical institutions, RGI helps custom design personalized research projects for rare diseases.